You want to fit a baby restraint to your car. What should you secure the restraint to? You want to fit a baby restraint to your car. What should you secure the restraint to? A. Only at the back using the seat belt provided. B. An anchorage point designed for a baby restraint. C. Any seat belt in the back or front of the car. Correct. Most modern vehicles have anchorages for baby restraints (often called isofix points). When you drive you have the main responsibility for your safety and the safety of other road users. When you first get in your car or anyone else’s car, adjust the seat and mirrors so that you have a comfortable driving position and you can see all around you. When following a vehicle in dry weather with good visibility you should leave three seconds between you and the car in front. This gives you plenty of time to stop if the vehicle in front stops suddenly. In wet weather it will take further and longer to stop because the friction of the tyres on the road is less. At night, leave a slightly longer distance between you and the vehicle in front (around 4 seconds) because it’s more difficult for you to judge distances. This is especially true when it’s a motorbike ahead of you because that’s only one point of light which is more difficult to judge. Driving too close to the vehicle in front is called tailgating and reduces your changes of being able to brake in time of the vehicle ahead stops, and also reduces your visibility of the road ahead. Sleepiness will eventually descend on your if you don’t take breaks while driving. If you are a new driver you will probably mentally exhausted after an hour; more experienced drivers might be able to go 3-4 hours without a break. If you start feeling sleepy while driving it’s best to find a safe place to pull over and have a short nap of 10-15 minutes. You can ensure a supply of cool, fresh air in the cabin, but this won’t keep you awake for long. Once you start to feel sleepy it’s only a matter of time before your brain starts to take micro-sleeps (moments of a few seconds long where you actually involuntarily fall asleep), and eventually you will fall fully asleep at the wheel. Before you leave for a long trip, make sure you have enough sleep. Most crashes caused by fatigue occur between 11pm and 8am, so try to avoid driving when you would usually be sleeping. If you are riding a motorbike bear in mind that motorbikes are much more tiring to ride than driving a car. As well as taking breaks you’ll need to dress appropriately for the weather as being too hot or too cold will affect your tiredness. Heavy vehicle drivers are bound by rules that prevent them from driving too many hours in a day. Fatigue law applies to all drivers who drive heavy vehicles, buses, or truck and trailer combinations over 12 tonnes or exceeding 12 adult passengers. This is what’s called a ‘regulated heavy vehicle’. Heavy drivers must keep a work diary that includes their location and odometer reading at each work and rest change, and their work and rest hours. In any seven-day period a solo driver working under Standard Hours and driving a vehicle with a gross vehicle mass (GVM) of more than 12 tonnes can work up to 72 hours. This is much more than in places such as the UK which limit it to 56 hours and 90 hours in any two-week period. We do have much longer distances to drive and fewer service areas than in the UK. Drivers must keep at least the last 28 days’ records in their vehicle. A solo driver working under Basic Fatigue Management hours driving a vehicle of more than 12 tonnes must take at least a 30-minute break within any 9-hour period. This can be taken in two blocks of 15 minutes. The maximum time that can be worked in any one day is 12 hours, or 60 hours in any one 7-day period. Whenever visibility is compromised, turn your lights on low beam if you don’t have daytime running lights, for example if it’s raining or misty. Motorbikes should always ride with dipped (low beam) headlights if they don’t have daytime running lights. If an oncoming vehicle’s headlights dazzle you, look to the left of the road. Don’t put your headlights on full beam (or high beam) as this just means that now both of you have limited visibility. Once the other vehicle has passed your eyes will need a few seconds to adjust back. There’s a car visible in this image – look closely – it’s less than 150m away and the speed limit is 100kph. If it didn’t have lights on it would be almost invisible. In fog you should slow down. Use dipped headlights rather than full beam because the fog will reflect the light from full beam headlights back at you. If your vehicle has fog lights, use them. They will consist of small spotlights mounted low down at the front of the car and one or two bright red lights at the rear that have roughly the same intensity as brake lights. 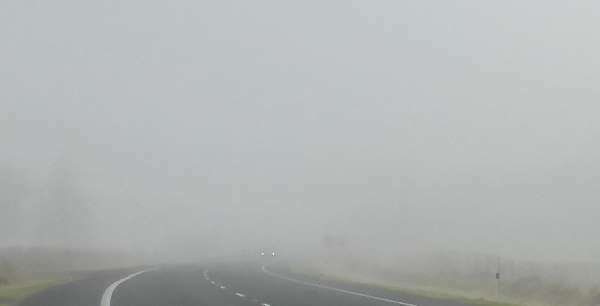 For this reason you must turn off your fog lights when it’s not foggy because you can dazzle other drivers. At dusk, turn on your lights and remove your sunglasses so that you can see better. Use full beam headlights unless you are parked, there are vehicles coming towards you, or a police officer or traffic controller is directing traffic, when you should dip your headlights. You can use your high beam headlights on roads where there are streetlights if it helps you see better. Your wheels are more likely to skid on a wet road. You get the best braking performance in a straight line. If your wheels have to brake and turn at the same time it’s easier to overcome the friction of the road. Therefore braking before you start cornering is especially important in the wet, and even more so for motorbikes. If you have anti-lock brakes (ABS) this will stop you skidding, but it can’t override physics: if you enter a corner too fast, it could be that no amount of preventing your wheels from locking will stop you skidding off the road. ABS just stops you skidding, not crashing. If your vehicle has ESC (electronic stability control), this will help you more by braking each wheel individually if you get into a skid to try to keep you going in the direction you are pointing the wheels. If your one or more of your wheels run off the edge of the road gently brake and steer back on the road. Don’t panic otherwise you could cause a skid or spin. Seat belts save lives and prevent injury. They are the most effective device for protecting passengers in an accident. They must always be worn properly and buckled tightly. When you take anyone in your vehicle it’s important that you have enough seat belts for everyone. It’s compulsory for all passengers to wear seat belts when they are fitted in the vehicle, unless they are exempt for medical reasons. Drivers are responsible for all passengers wearing a seat belt. Any passenger aged 16 or over who isn’t using a seat belt where one is available will be fined along with the driver. Children aged up to 7 years must be in an approved child restraint or booster seat suitable for their age and size – these must be fitted in accordance with the manufacturer’s instructions. They usually attach to ISOFIX points. Don’t carry children in your arms (you won’t be strong enough to hold in in a crash). Children under 7 must travel in the rear seat of a vehicle with two or more rows. A child aged 4-7 can travel in the front seat if all other seating positions have been used by children who are younger. Booster cushions use with a lap-only seat belt must have a child harness. All approved child restraints will have an AS standard displayed, and restraints are available for children up to 32kg/10 years old. If your vehicle doesn’t have seat belts, the best place for passengers is in the back seat as it will give them the most protection.